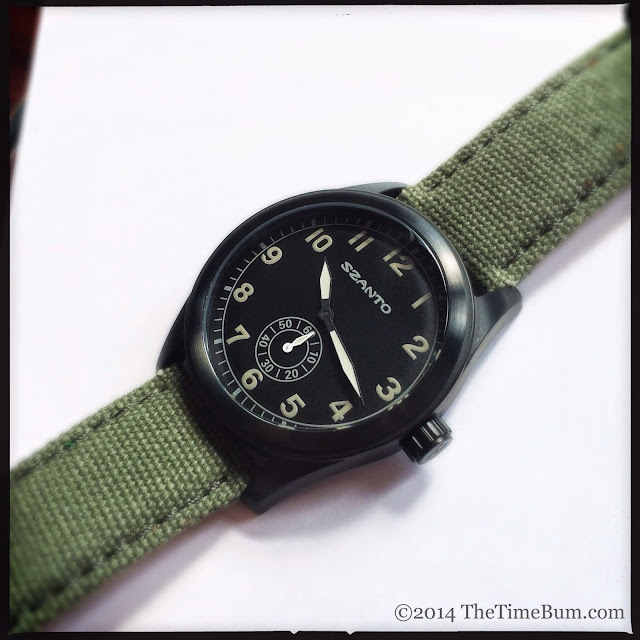 In my previous post, I introduced you to Szanto Watches, a new brand dedicated to producing vintage style watches at an affordable price. The first of the line to receive The Time Bum treatment is the 1002, a three hand, small seconds watch with a strong military influence. Like all watches in the Szanto line, it uses a Miyota quartz movement. MSRP is $225. To my eye, the 1000 series resembles the British "broad arrow" W.W.W. (Waterproof Wristlet Watch) issued during the Second World War. Produced by several companies including Omega, Cyma, and Record, these watches had black dials, a 60 minute chapter index, simple Arabic numerals, and a small seconds sub dial. The 1002 echoes these elements in a beefed up package. At 40mm diameter, it is the smallest watch in the Szanto catalog but considerably larger than its 1940's inspiration. Those watches were approximately 35mm, which would have been mid sized at the time, much the same as a 40mm appears today, and I am pleased to report that the up scaling has not destroyed the proportions of the dial. Given its modest size, it is no surprise that it fits easily under most shirt cuffs. In keeping with its combat origins it is rated for 100m water resistance, which makes far more practical in this field than its ancestors. The round, stainless steel case wears a black, low-sheen IP coating. This is a modern touch that further differentiates it from the vintage watches, but is perfectly in keeping with the military aesthetic. 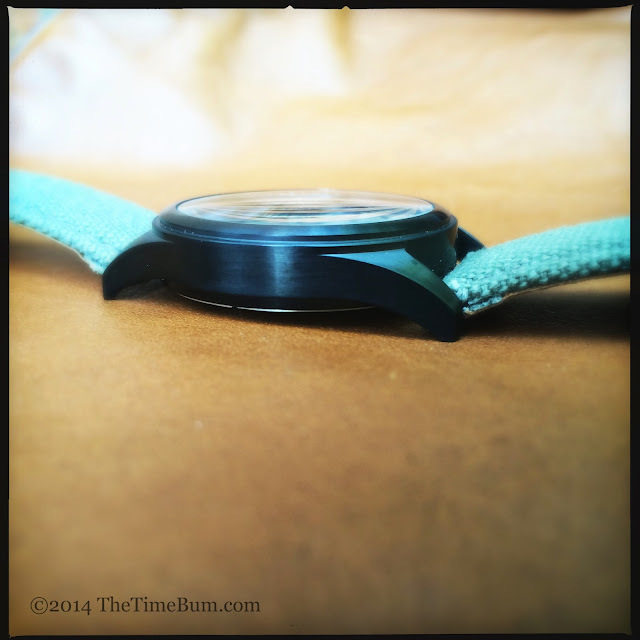 The unadorned bezel gives the case some visual weight. 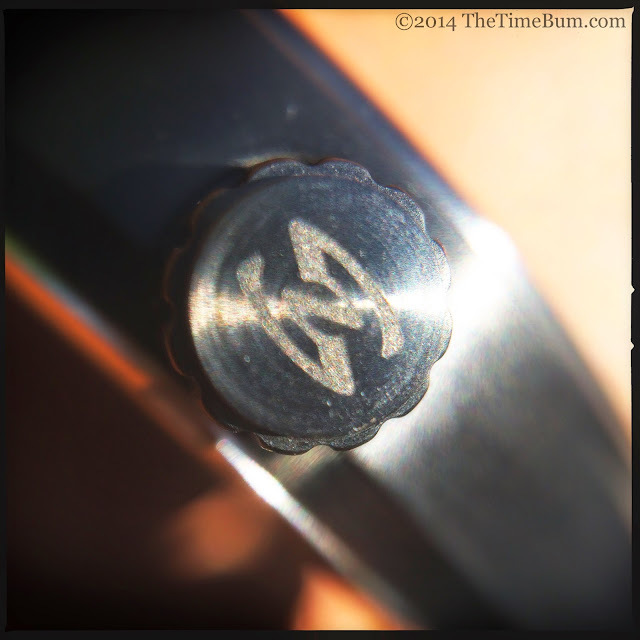 The sturdy looking push-pull crown is decorated with the Szanto "SZ" logo that also graces the engraved case back. The crystal is mineral glass. Military field watches of this type generally had rather pronounced acrylic domes so little bit of a bubble would have created more of a traditional feel, but this is really a minor nit to pick. The lugs are curved inward from the case, but they are proportionately shorter in relation to the case than the longer, more tapered lugs of the 1940's watches. They are also angled downwards, reducing the watch's profile on your wrist. The khaki colored numerals look as if they have mellowed and darkened with the passing of time. Sword shaped minute and hour hands are black, while the small second hand is white. Both are filled with off-white lume. They stand out against the otherwise muted dial but do not detract. Even fully charged, the night time illumination is not particularly strong. The hands produce more of a glow than the darker numerals, but neither lasts long. The only text on the dial is the Szanto brand and I must take a moment to highlight this detail. Regular Time Bum readers know I am no fan of excessive verbiage on a dial, and I believe too many designers ruin their watches with overblown logos, uninspired fonts, or both. On this watch, the brand name is rendered in a gently curved, Art Nouveau typeface that lends an old world look without becoming a caricature. It is printed in a pale grey color that is repeated in the chapter index and small seconds sub dial. This is an important design element, and Szanto got it right. 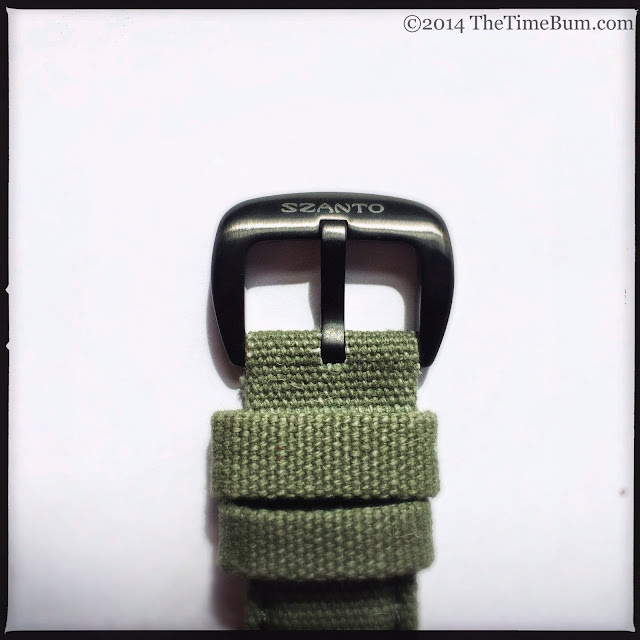 The watch wears a two piece, 22mm, olive drab canvas strap. This is on the large side for a 40mm case, and it gives the watch a bit more presence. 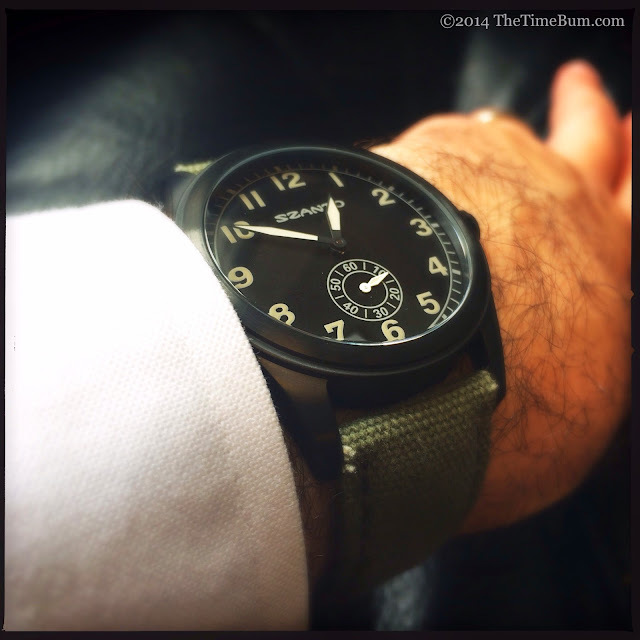 Canvas is a perfect choice for a field watch: tough, utilitarian, and it does not look embarrassingly new. It is also well made, with matching stitching, leather backing, and an engraved black buckle with a heavy, rounded frame. It is 75/125mm (short/long end), which creates a little extra tail on my 6.5" wrist, but should provide some room for guys with wrists on the larger side. 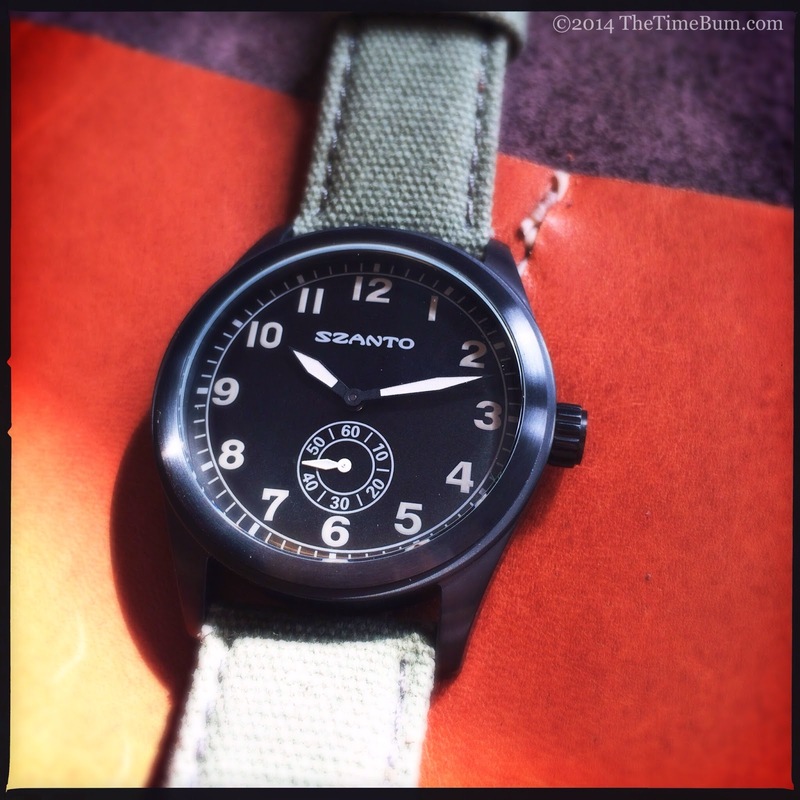 The Szanto 1000 series consists of four black dial variants with different color straps, and one green dial model on a charcoal strap. The 1002 nails the 1940s broad arrow style, and then updates it just enough to make it feel at home in 2014. The muted colors and black case give it a brooding gravity appropriate for a military inspired timepiece. Better still, the 100m water resistance means you can actually use it in the field without worry. Indeed, a little bumping and scraping would only make it seem more authentic. On the canvas it is a very casual watch, but if you were to swap it out for a leather strap (maybe something oily with a nice pull-up effect) you could easily wear it to the office too. Overall, I think this is a handsome watch that offers good value for the money. Pro: Classic good looks with real world utility. Sum: Broad arrow look for the broadband age. The Time Bum approves.